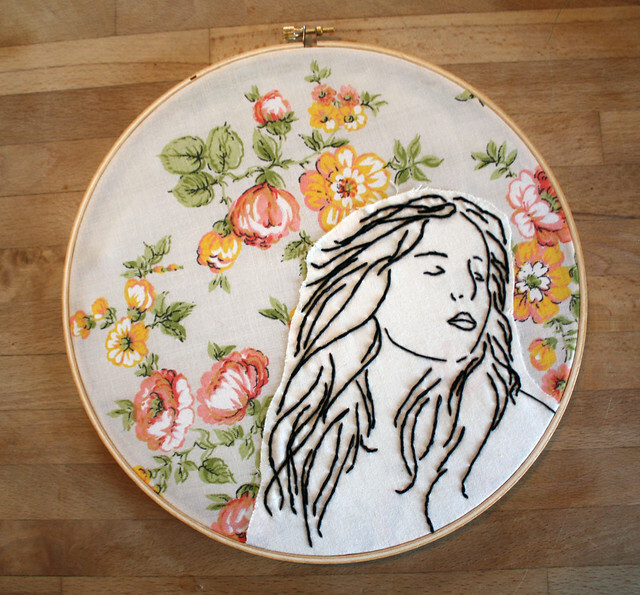 I'd like to introduce you all to Bec Groves, an embroidery artist I've been following ever since I first saw her work on Flickr. She was kind enough to answer a few questions for us, so you can all get to know her. Read on! Your hometown and current city? I grew up in Huntsville, Ontario. I spent a majority of my adult life in Sackville, New Brunswick, until recently moving to Peterborough, Ontario where I live with my partner Steve, our dog (Ava!) and kitten (Olive!). Can you cite any specific influences in your work? My inspiration comes from people and their stories. I’m extremely lucky to be surrounded by amazing people. I spend a lot of time trying to capture moments and feelings I’ve shared with my friends and family. 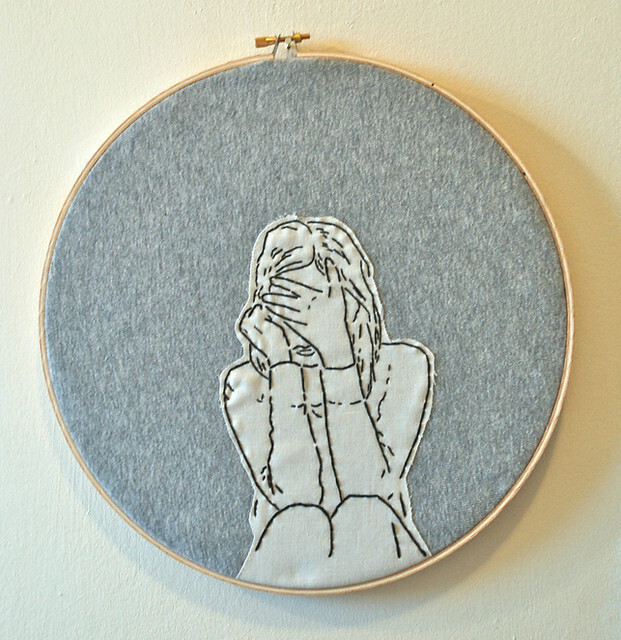 I really love the emotional quality in your embroidered pieces - what do you think makes you stitch this way? I stitch the way I feel. There’s just something about the process of embroidering that allows me to slow down and really capture the details and create unique movements in the work. 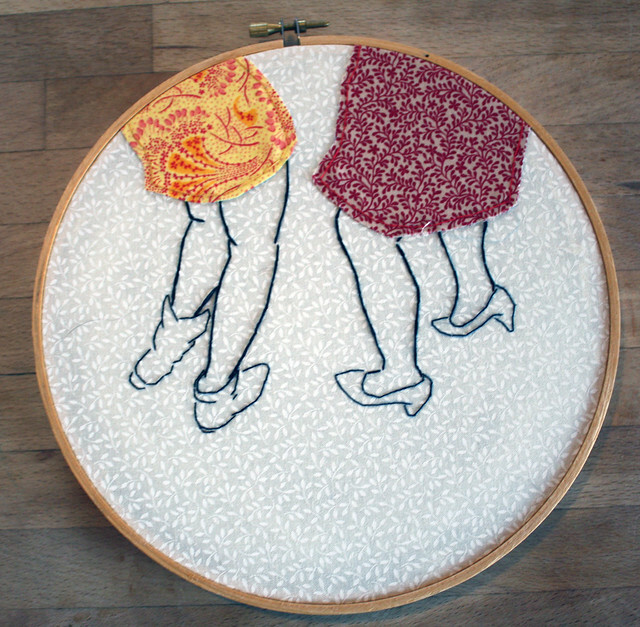 Embroidery allows me to design and construct these moments in a way that is different from any other medium and creates a work that is both wonderful and strange. Do you work from drawings or use photos as reference? Both. I design and draw everything, but often reference my own photographs or images that I encounter and inspire me. Please describe to us your creative process. I feel like my ‘creative process’ differs from project to project. Sometimes it just hits me and I jump out of bed at 5am with an image and than I spent the next four hours drawing and searching for the right fabric. I find that I’m most productive before 9am. Do you have an art background - if so, how do you think this has affected your work? I have a Bachelor of Fine Arts from Mount Allison University, a small school in New Brunswick, Canada. I’m a stronger artist because of my time there; I learned technical skills for a variety of different mediums, was given the skills needed to become a working artist, and I benefited from the support of a strong, close-knit art community. 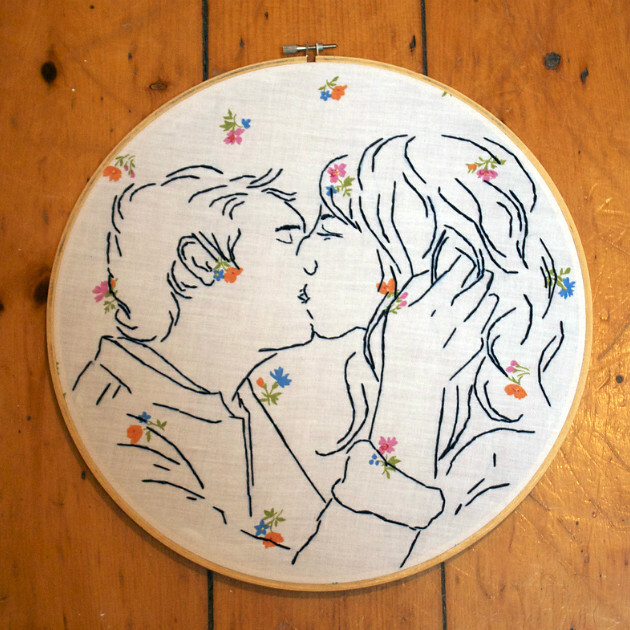 Do you have a favorite brand of embroidery floss? Or do you stitch with whatever’s on hand? I use DMC and Anchor mainly. But I don’t feel attached to any one brand. 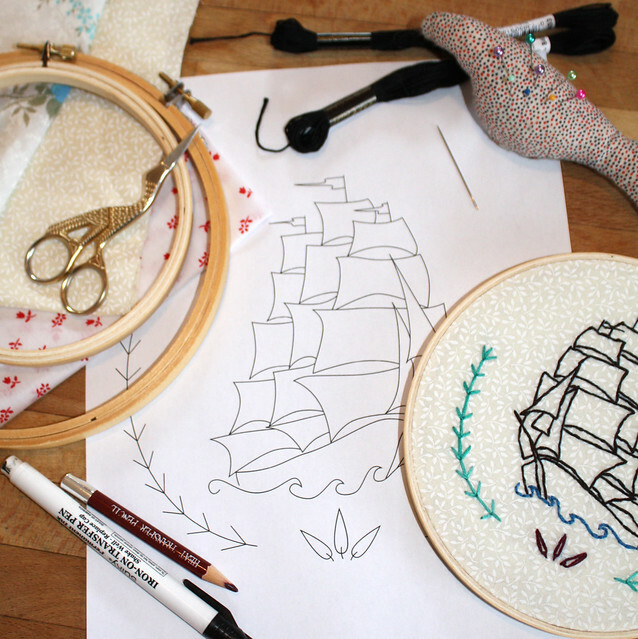 When I started really getting into embroidery I rooted through a lot of my mom's old supplies. So I’m working my way through a supply of hand-me-down floss from my mom (that she may not know I took…oops!). I think I’ve just stuck with the brands that she used. Like mother, like daughter! There’s one image that I’ve titled “Stella & Fawks” and it’s an image that has had many “new lives.” It was actually one of the very first images that I ever sewed and I’m constantly reinventing it. It’s that indefinable, intangible love between a fox and a girl. It's one of those moments I’m capturing that I feel is continuous and I don’t think I’ll ever be done with it. I LOVE Joel Plaskett & the Emergency, Hannah Georgas, The Raul Alberta Advantage, Entire Cities and Fleet Foxes. What do you LOVE most about the online stitching community? I love that everyone is so willing to help one another and answer each others’ questions and share experiences and give advice. It’s so encouraging. Thanks, Bec, for taking the time to sit down and chat with us! This is just fab. 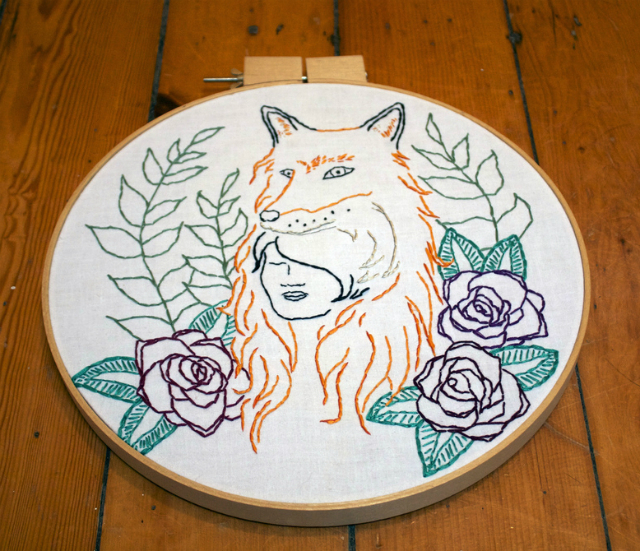 Great feature on a very interesting embroidery artist. I'll be checking out her website!